Today, March 17th, celebrates the life and work of the patron Saint of Ireland, Saint Patrick. 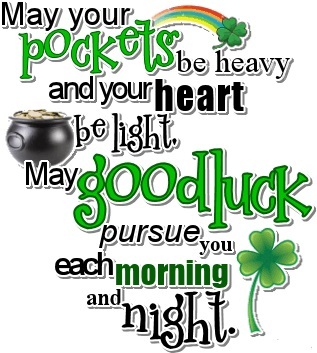 Saint Patrick’s Day was made an official Christian feast day in the early 17th century and is observed by the Catholic Church, the Anglican Communion (especially the Church of Ireland), the Eastern Orthodox Church, and Lutheran Church. The day commemorates Saint Patrick and the arrival of Christianity in Ireland, and celebrates the heritage and culture of the Irish in general. Celebrations generally involve public parades and festivals, céilithe, and the wearing of green attire or shamrocks. Christians also attend church services and the Lenten restrictions on eating and drinking alcohol are lifted for the day, which has encouraged and propagated the holiday’s tradition of alcohol consumption. On St Patrick’s Day it is customary to wear shamrocks and/or green clothing or accessories (the “wearing of the green”). St Patrick is said to have used the shamrock, a three-leaved plant, to explain the Holy Trinity to the pagan Irish. This story first appears in writing in 1726, though it may be older. In pagan Ireland, three was a significant number and the Irish had many triple deities, a fact that may have aided St Patrick in his evangelisation efforts. Get in touch with Masterflex, and let us know how will you be celebrating? This entry was posted in Antistatic & Electroconductive hose, Automotive - Motor sports / F1 / Boats / Rail, Dust & Fume Extraction, High Temperature Hose, HVAC - Heating, Ventilation and Air Conditioning, Materials Handling - Plastics, Rubber , Powders, Microbe & Hydrolysis-Resistant Hoses, Paper, Printing and Packaging, Plastics, Street cleaning leaf and grass collection, Woodworking Industry and tagged air and ventilation hose, Chemical Ducting Fume Extraction, DUCTING, Ducting Connecting Systems, ductings, Dust extraction hose, Exhaust Extraction Hose, exhaust fumes removal, Flexible ducting, flexible ductings, Flexible hose, flexible hoses, Fume Extraction hose, High temperature ducting, High Temperature Ductings, High temperature hose, hose, hoses, Masterflex technical hose ltd, Masterflex technical hoses ltd, Polyurethane ducting, Polyurethane hose, PTFE Ducting, PTFE Ductings, PTFE Hose, PTFE Hoses, PU DUCTING, PU hose, PVC ducting, PVC ductings, PVC hose, PVC hoses, Silicone Ducting, Silicone Hose, templine Heated Hoses, weld extraction hose, Weld Fume Extraction, Weld Fume Extraction Hose. Bookmark the permalink.